"Brilliant! I have used this service for our Christmas Party and recently for my son's birthday party. Fantastic!" Are you planning a party on the Sunshine Coast? If so, why not let Boomerang Bus Hire provide you with the perfect party bus? Whether it's a golden wedding anniversary, a glitzy girl's night, or a gleeful toddler's birthday party, we can adapt our service to suit your event perfectly. Unlike many other charter bus companies, we are happy to take hen and buck parties on our vehicles. Get your friends off the road so you can have fun and stay safe on your night out. Email or call 1300 BUS MAN to get more details. Whatever the reason for your celebration on the Sunshine Coast, take the stress out of "getting there" with a party bus. We take our transport seriously to ensure an excellent service, but we're relaxed enough to understand the high spirits that accompany a celebration. Feel free to enjoy yourself on a Boomerang Bus Hire party bus. You'll be surprised how economical our service is. 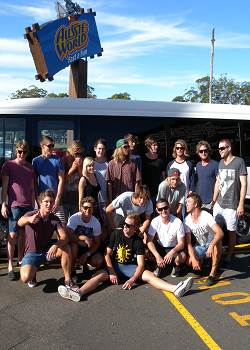 When compared to the cost of taxi travel for large groups, the Boomerang Bus Hire party bus can even SAVE you money. And no need to worry about drink-driving or finding a parking space. In fact the Boomerang Bus Hire party service is so stress-free that you'll be left with nothing to do but party, party, party! Children are the biggest party-lovers of all. So if you're looking for a twist to make their big day special then hire a Boomerang Bus Hire party bus. In fact, for many kids, the bus trip is the highlight of the day. We offer competitive prices on party buses throughout the Sunshine Coast, going to all the main party venues, including Top Shots, Aussie World, Australia Zoo, Underwater World and much more. Wherever you want to go, our fabulous party bus service will take you there and back, effortlessly. At Boomerang Bus Hire, safety is of paramount importance. Seat belts are available for all passengers, and we encourage their use, especially when transporting our younger (and more lively!) passengers.